The apartment Zeus is located on the ground floor of our complex. It is a spacious apartment that can comfortably accommodate 4 people. It consists of a large living room with 2 sofa beds and a fully equipped kitchen. Features a bedroom with a double iron bed. Its furnishings are in classic island style. It has a bathroom with shower, hairdryer and personal care products. It has a large courtyard on the sides of the apartment, with a limited view of the sea. The Artemis Suite is a one-room apartment, comfortable and bright, ideal for a couple. 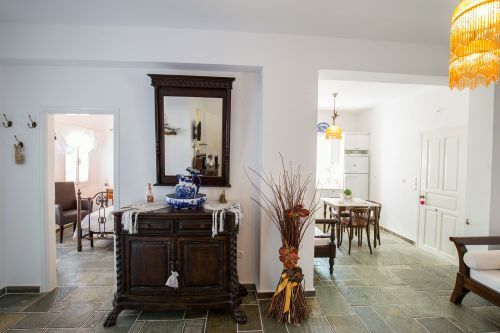 Features a double bed and is furnished in a romantic style. It has a fully equipped kitchen and a bathroom with built-in shower, hairdryer and personal care products. 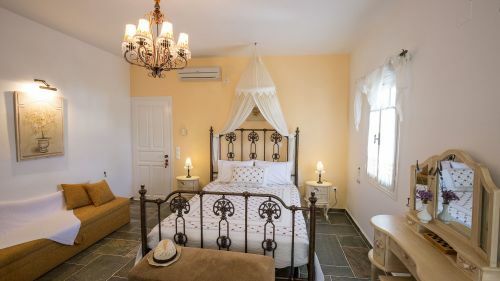 The apartment has two verandas with dining areas to relax while enjoying the tranquility of the countryside and views of the beautiful garden. On the first floor of GERANI SUITES is located the Apollo Apartment. It is a comfortable and fully equipped apartment that can accommodate 3 adults or a couple with 2 children. It consists of a large living room which is integrated with the equipped kitchen. It has a sofa that turns into a double bed. Features one bedroom with a double bed and a private wc. There is a bathroom with shower, hairdryer and personal care products. 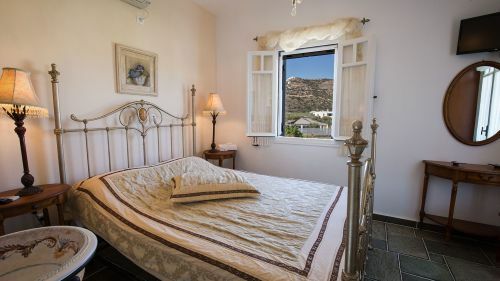 It has a corner balcony with 2 living rooms overlooking the garden, the settlement of Platys Gialos and a limited view of the sea.